Take I-195 West. At exit 2B, take ramp right for SR-295 South / Baltimore Washington Pkwy South toward Washington. Take ramp right for US-50 West / New York Ave toward Washington. Turn left onto I-395 South. At exit 8C, take ramp left for US-1 South / Jefferson Davis Hwy toward Pentagon City / Alexandria / Crystal City. Arrive at US-1 South / Jefferson Davis Hwy on the right. Depart S Smith Blvd. Take ramp right and follow signs for George Washington Memorial Pkwy North / GW Pkwy North. Take ramp right for I-395 South / US-1 South / Henry G Shirley Memorial Hwy toward Richmond. At exit 8C, take ramp left for US-1 South / Jefferson Davis Hwy toward Pentagon City / Alexandria / Crystal City. Arrive at US-1 South / Jefferson Davis Hwy on the right. Depart Saarinen Circle toward Copilot Way. Bear right onto Copilot Way.Turn right onto Cargo Dr.Road name changes to Aviation Dr.Take ramp left for Dulles Airport Access Rd toward Washington. Take ramp right for SR-267 East / Dulles Toll Rd toward Richmond / Baltimore / Exit 18-19. At exit 19B, take ramp right for SR-123 North / Dolley Madison Blvd toward McLean.Take ramp right and follow signs for George Washington Memorial Pkwy South / GW Pkwy South. Take ramp right for I-395 South / US-1 South / Henry G Shirley Memorial Hwy toward Richmond. At exit 8C, take ramp left for US-1 South / Jefferson Davis Hwy toward Pentagon City / Alexandria / Crystal City. Arrive at US-1 South / Jefferson Davis Hwy on the right. Take the Yellow Line in the direction of Mount Vernon Square. Crystal City (first stop). Exit Metro Station, turn left, walk 100 feet, turn right, walk under overpass, hotel is on left. The NASA Space Grant community is pleased to announce that Dr. Christopher P. McKay has been selected as the recipient of the 2019 National Space Grant Distinguished Service Award. Christopher P. McKay is a planetary scientist at NASA Ames Research Center, studying planetary atmospheres, astrobiology, and terraforming. McKay majored in physics at Florida Atlantic University, where he also studied mechanical engineering, graduating in 1975,and received his PhD in astrogeophysics from the University of Colorado in 1982. McKay has done research on planetary atmospheres, particularly the atmospheres of Titan and Mars, and on the origin and evolution of life. He is a co-investigator on the Huygens probe, the Mars Phoenix lander, and the Mars Science Laboratory. He also performed field research on extremophiles, in such locations as Death Valley, the Atacama Desert, Axel Heiberg Island, and ice-covered lakes in Antarctica. 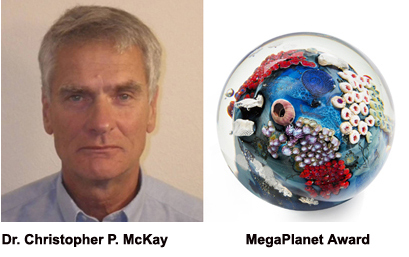 McKay is the Principal Investigator of the proposed Icebreaker Life astrobiology mission to Mars. In 2015 he received the Nevada Medal. He was a member of the board of directors of the Planetary Society and also works with the Mars Society, and has written and spoken on space exploration and terraforming. He is also an adviser for the Microbes Mind Forum. McKay advocates a moderately biocentric position in the ethics of terraforming, arguing that we must thoroughly explore a planet such as Mars first to discover whether there is any microbial life before taking first steps toward terraforming, and that if indigenous alien life is found in an obscure niche or dormant on Mars, we should remove all Earth life and alter Mars to support the global spread of this alien life on Mars. He has held a series of public debates with Robert Zubrin, who advocates a moderately anthropocentric position on the ethics of terraforming. To purchase indiviual tickets, or to sponsor a table of 8, please contact event host, Eric Day, at: day@spacegrant.org. The National Space Grant Distinguished Service Award was established to recognize individuals whose life and career have had a long lasting impact in a science, engineering or education field that is related to aeronautic, aviation, or space endeavors. The inaugural award was presented in 2003 to former Senator and Secretary of the Treasury Lloyd M. Bentsen for his visionary work in creating the National Space Grant College and Fellowship Act. Past Recipients of the National Space Grant Distinguished Service Award: Lloyd Bentsen, James Van Allen, Peter Diamandis, John Glenn, John Young, Leon Lederman, Vera Rubin, Neil deGrasse Tyson, Sally Ride, Julius Dasch, Ellen Ochoa, Bill Nye, and Katherine Johnson. Copyright 2019 - National Council of NASA Space Grant Directors. All Rights Reserved. Website developed, designed, and maintained by Eric L. Day.